The Sulayr Short Break offers three full day rides. The first day in the Poqueira Valley. The second day we head east to the village of Trevelez, where we stay the night. On the third day we climb high into the mountains and return to the home base by a different route. After breakfast you will be driven the 5 kilometres up to the stables, where you will meet the horses. The ride will vary slightly depending on the weather and the time of year. We will ride an average of 6 hours following the acequias (ancient Moorish irrigation channels), old bridle paths and tracks through the valley Poqueira to the base of the Mulhacen , at 3,486 meters the highest mountain on the Spanish mainland. Today we ride to the whitewashed village of Trevelez, the highest village in Spain and famous for its air cured hams. During the morning the old bridle paths wind their way through chestnut woods, orchards and terraces above the villages of La Taha. After a picnic lunch we join the main forestry track through the pine woods, here there are opportunities for some nice canters. 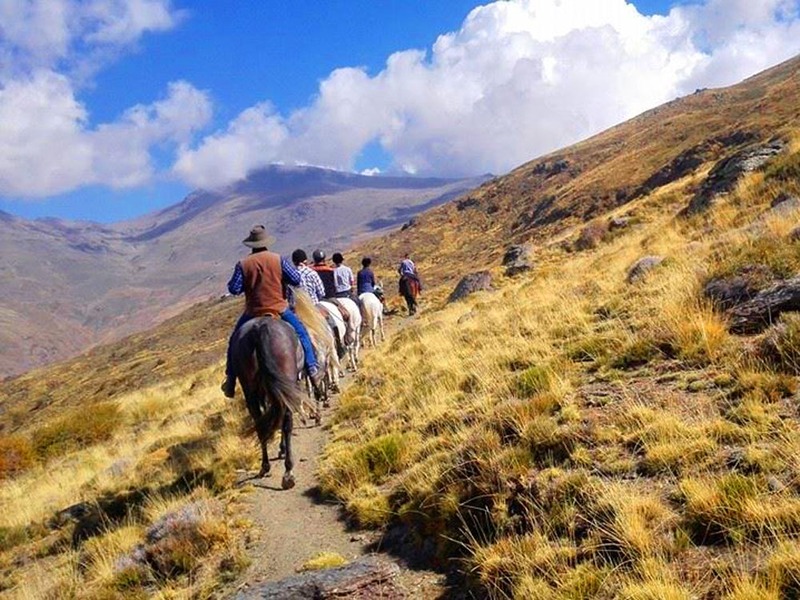 The final descent into the village is on a narrow path and it is necessary to lead the horses for 15 minutes. Trevelez still has cattle and sheep, the cattlemen and their horses heading out to the hills is a common sight in the early morning and late evening. Overnight in hotel La Fragua, dinner at local restaurant. 5 and 6 hours riding, approximately 28 kilometres. Returning to Bubion we follow the forestry track and then the Sulayr path through oak woods and open pasture lands high above the village. Picnic at 2.300 meters with stunning views over the Mediterranean, the valley of Trevelez and the foothills of the Contraviesa. During the afternoon we leave the open pasture lands behind and follow the path descending through pine woods to the stables. Farewell drink in the village of Bubion and overnight in Casa La Sevillana. 6 hours riding. Approximately 25 kilometres. Includes dinner on the night of arrival and overnight in Trevelez. The price is based on a double or twin room, if you require a single room there is a supplement of 75 Euros. Also the 4k walk down the side of the mountain to Trevelez, but that was to do with the intense heat rather than the distance. All in all I didn’t ache half as much as I thought I would given the number of hours we were riding each day. The food was always plentiful and delicious. As I didn’t eat much breakfast (too early! ), the picnic lunches were always welcome and the evening meals substantial – just what was needed after a day in the saddle. Cold beer was often on my mind during the hottest parts of the day and it hardly touched the sides when I eventually got one. All the accommodation was of a good standard and always clean, although there always seemed to be a party going on outside my window – ah well, that’s Spain! I thought the refuge was a really interesting building built in such a beautiful spot – definitely worth an overnight stay.